I really wanted to write a story about chiyogami, but somehow it felt like I was jumping the queue – I will get to the Japanese papers in good time. I have taken a few steps back to help myself at least gain a better understanding and ‘refresh’ on the world changing invention that was paper. I work with paper on a daily basis, and as I look around my living room, I see so many uses of paper in my daily life that I take for granted. I know it is made from wood pulp, I even loved making my own recycled paper as a child, but I can’t remember ever stopping to really look into its history and the process behind it. I acknowledge that the word ‘paper’ comes from the word ‘papyrus’ which is an Egyptian creation, but paper as we know it today originated in China around 105AD. The oldest know piece of paper found dates to between 174-41BC, however the man at least credited with refining the process, Cai Lun, lived in 2nd century during the Han Dynasty. During the Shang (1600-1050BC) and Zhou (1050-256BC) dynasties documents were composed on several material, each with its own limitations. 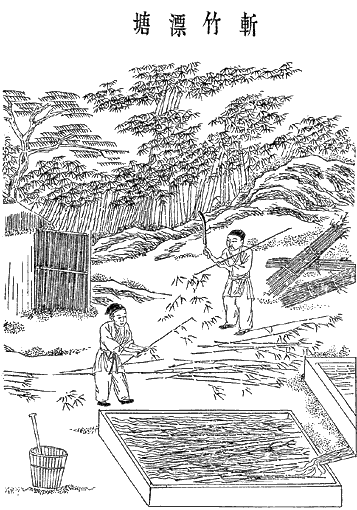 Bamboo strips – which were lashed together with string and rolled into scrolls. These proved to be heavy and cumbersome. Bone pieces – characters were etched into pieces of animal bone or tortuous shell, dificult to etch and not easy to store. Silk strips – light weight and easy to move around, although silk was often too expensive to consider. 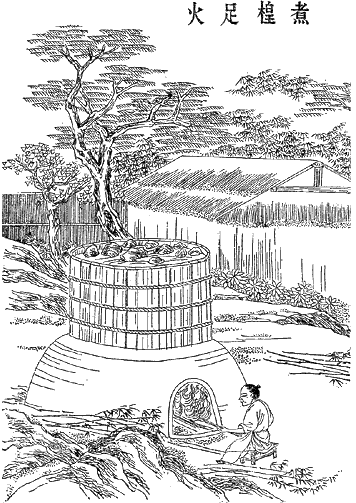 However, I can’t get caught up in such fanciful thoughts, so instead, this was the most common process of ancient Chinese paper making I found. 01. Cut material and leave them to soak in water until soft. 02. Boil the material adequately to remove all glues and resins. 03. Pound the materials to remove all skins and to reduce to a cloudy pulp. 04. Pass a screen through the liquid collecting the matted fibres. 05. Press the pulp to remove excess water. 06. Warm the paper or place in the sun to dry. Because the fibres of the pulp are still quite long even after the pounding process, this leaves the paper flexible and strong. the paper will not deteriorate as most of the acids are removed during the soaking and boiling stages, meaning the paper has the potential to survive hundreds of years. the paper will not stick together because all of the glues and resins have been removed. it is relatively light weight considering it is quite a thick stock. Specialty papers were made Chinese calligraphy and painting, the finest of these papers Shuan is mistakenly called rice paper, although it does not contain any rice, but it best for maintaining suitable ink absorbency and brush motions at various speeds. Mien, is a lower grade of calligraphy paper often called cotton paper, but again, contains no cotton. The third grade of paper Mao Bien is made from bamboo and is often printed with a grid (now days at least) to help practice brush strokes for practicing, it is a cheap alternative. It seems like such a simple invention these days, but I guess it was just so revolutionary. The process too for recycled handmade paper at least has not changed that much. The process described above is pretty much the process I remember using when I was a small child making paper. I find something comforting in that however,, paper is trustworthy and known. I just love it!